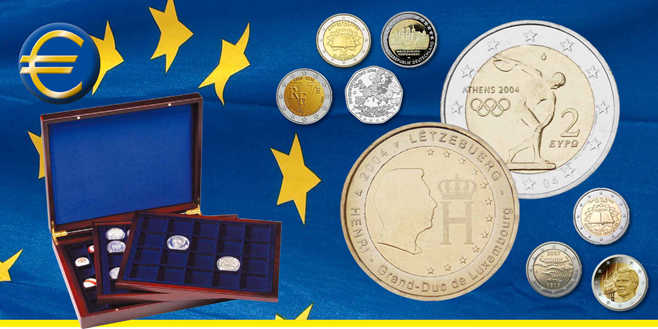 Since 2004, the Euro countries have been able to issue special national commemorative coins. This is limited to maximum two commemorative coins per year per country. The commemorative coins are 2 euro coins where the unique national design on the back side has been replaced by a special design. This is a very interesting collection are, but also quite difficult to collect complete since some countries issue very special coins and in different intervals. You will receive a delivery once per month approximately, either with a bi-coloured commemorative euro coin or with a special jubilee euro coin. First delivery : Price 10 Euro + delivery fee. In the first delivery you will receive the first 2-euro commemorative coin from Greece and the first special jubilee coin from Luxemburg. Total price 10 Euro + delivery fee. Second delivery: coin from Austria and an exclusive collector’s coin box. Price in total for the coin and the coin box is just 37 Euro + delivery fee. (Regular price is 66,60 EUR). All prices indicated are exclusive of delivery fee. You have two weeks’ right of return, and you are free to cancel your subscription at any time you may wish. First delivery. Price EUR 10 + delivery fee.